We had the privilege recently of supporting an unusual event &ndash; a boardgame tournament held internally at a large GE Digital office in Ohio. 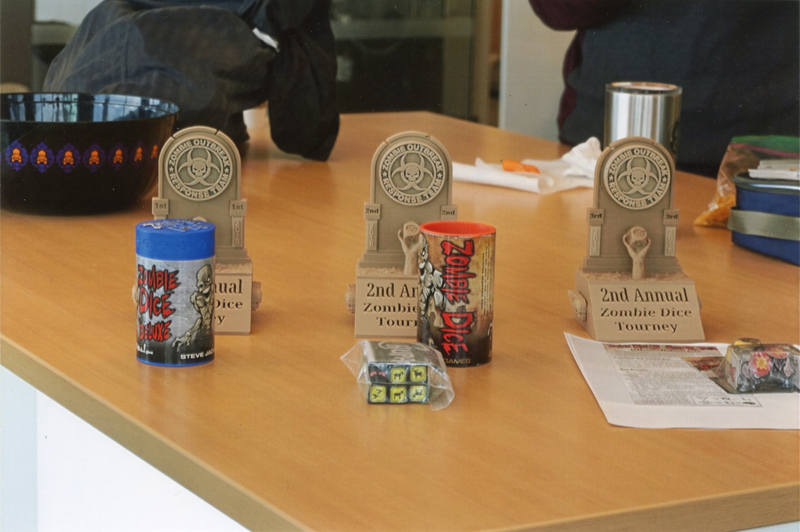 They drew more than 50 players for Zombie Dice and created these really classy 3D-printed trophies. They also used the 3D printer to create giant dice and grapefruit-sized brains. Brains! Have we said recently that Games are Good? Okay, saying that again. Whether it's for a weekend or just for 20 minutes away from your desk. Well played, gentlefolk! Spruce up your GURPS Martial Arts campaign with the adventure outlines and scenario-creation tips from Pyramid #3/14: Martial Arts. Can you survive an underground fighting circuit, a strange and terrible land, or crumbling terrain? Expand your combat prowess and your digital library with these downloads from Warehouse 23.